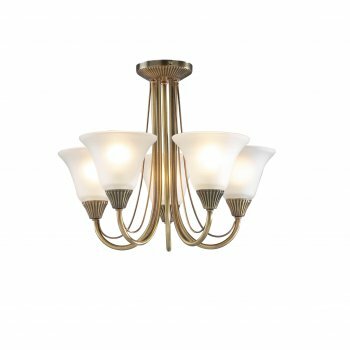 Dar Lighting Boston semi-flush 5 light semi flush ceiling fitting features a circular design ceiling plate with elegant curved arms all in antique brass finish holding conical shaped, acid etched glass shades. The product code for this Dar ceiling fitting is BOS05. This attractive semi flush fititng will sit well in both mdoern or traditional styled decors within your home and is especially suitable for rooms with low ceilings. There is also a 3 light ceiling fitting, single light wall fitting and 2 light wall fitting, table lamp and floor stand available in this range.